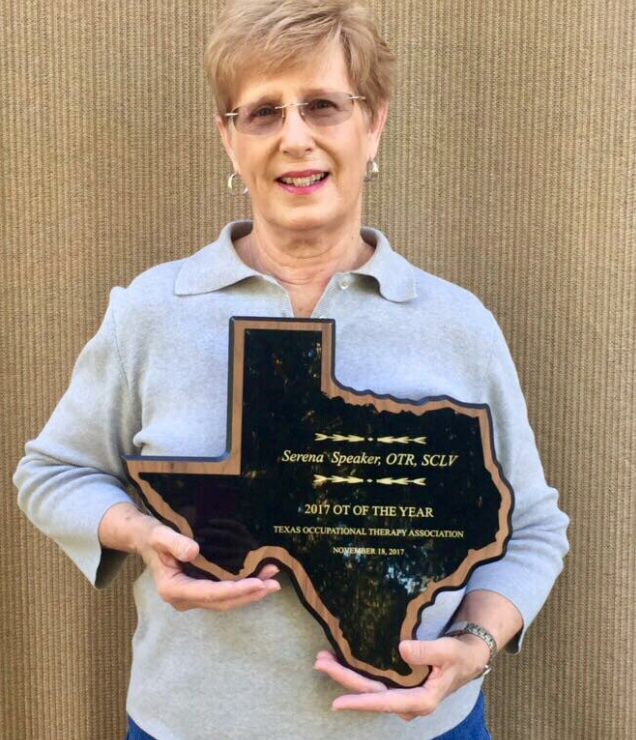 Bellville, TX, December 11, 2017—The Texas Occupational Therapy Association has named Serena Speaker Occupational Therapist of the Year. Serena Speaker currently serves as an occupational therapist CHI St. Joseph Health Therapy in Bellville and Brenham. She holds certificates in low-vision and vestibular therapies. TOTA recognized Speaker for her professionalism, leadership and service to the profession of occupational therapy at the local, state and national level. TOTA evaluates candidates’ fieldwork supervision, contributions to professional journals, volunteerism to promote OT awareness, membership in professional associations, membership in additional professional associations and additional certifications. About CHI St. Joseph Health Therapy: CHI St. Joseph Health Therapy teams are dedicated and equipped with the latest advances in therapy technology and are determined to help patients restore movement and function by creating therapy plans that take into account their needs abilities and objectives. Bryan, TX, November 30, 2017—Two young girls carried their piggy bank and $90 allowance in to CHI St. Joseph Health Regional Hospital. They were coloring while they waited for a loved one to have a procedure and felt like it would be nice to purchase coloring books for other young visitors or patients. According to one of the children’s family members, who accompanied them to the hospital to make the donation, the two girls had the idea to donate coloring books when they visited the hospital over the Thanksgiving holiday. As they were coloring, the two girls reportedly began to discuss how sad they were that other children in the hospital were there on the holiday and probably didn’t have anything else to do. The children and their family, who made the donation anonymously, pooled their combined saved money and piggy bank, about $113, to make the donation. About CHI St. Joseph Health Cancer Center: Since 1936 CHI St. Joseph Health has been caring for the communities of Bryan, College Station, Brenham, Hearne, Navasota, Caldwell, Madisonville and Bellville. With the area’s only Level II Trauma Center, the first Joint Commission-certified Primary Stroke Center and the first accredited Chest Pain Center in the Brazos Valley, CHI St. Joseph Health is a leader in critical care and the largest provider of cardiovascular care in the region.